I had some ideas for blogs today, some of them seasonal and relevant, but all my good ideas got wiped out when I went to Walmart and got punched in the face by the fake cinnamon pinecones. I’m only half kidding. I think I might have gotten a little bit of brain damage and some good-idea loss from the fumes. Some of my talking good skills maybe were made not so good now. Every Christmas season – and by that I mean between mid-October and Dec. 26, the day the Easter decorations and beach balls get put onto the shelves – those cinnamon pinecones take center stage in a lot of stores where I shop (cheap ones). As strong as they smell, they don’t really have to be center stage; they could be tucked away with the shoe laces and car care supplies, near the restrooms, and still cause watering eyes at the front door. At this point, would we even know we were supposed to start holiday shopping if it weren’t for the cinnamon pinecones? I fail to understand cinnamon pinecones. 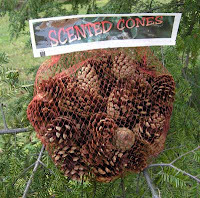 Real pinecones don’t smell anything remotely like cinnamon. There’s nothing Christmasy about a cinnamon smell. So how did we get to this point? Because of this keen sense of smell, I avoid a lot of craft stores, particularly the ones with poor ventilation, and at the mall I walk a wide arc around Yankee Candle, even if it means walking right into the head massager salesman’s Ground Zero. I want to know who is buying the cinnamon pinecones. According to my scientific research, no one. Because the bin of cinnamon pinecones at Walmart is always stuffed to the brim. There’s never any chance that they’ll sell out of all the cinnamon pinecones. They’re dirt cheap already, so I don’t think they would sell any better if they were free. Who wants their house to smell like Walmart in Autumn? I know this is going to make me sound like a female Andy Rooney, but I don’t really understand these products that are supposed to make our houses smell good. I know my house has smelled bad off and on. Until we lived in this house for more than a year, it smelled like cold, wet stone. I felt like I was entering a limestone quarry or a cave when I walked in the house. To get rid of it, I had to cook lots of Italian food. But I couldn’t bring myself to pop in Glade Plug-ins or spray Fabreze or simmer some potpourri on the stove. With a couple of exceptions, I don’t like artificial scents. There’s a popular country potpourri that smells like cold Campbell’s vegetable soup before you mix it with water and heat it. I’ve been in houses with that potpourri and it’s pretty unappetizing. Not to drive a point into the ground, but these cinnamon pinecones . . . Why can’t they treat them like all the other pee-yoo-zy potpourri and put them in sealed bags, to preserve the smell for when you get home and need it? The cinnamon pinecones are in netting, like an onion sack, so the whole store smells like them. Do you think it’s because if kept contained, that cinnamon smell might melt plastic? Follow Just Humor Me on Facebook Networked Blogs. Or follow me on Twitter at http://twitter.com/DianeFitzpatric (I usually Tweet my new posts.) Or become a regular old-fashioned follower by clicking on FOLLOW to the right and below under Google followers.